Performing in Moving Arts Theater Company Holiday Fundraiser! Come support local theater and see me perform a ten-minute two-hander with the talented Mark Taylor at the Moving Arts Holiday Party/Fundraiser on December 15. We’ll be performing “Yuletime” by Lee Wochner, a moving short piece about a couple finding their way through tragedy during the holiday. Every year Moving Arts has a holiday fundraising event at the home of one of their Board members. 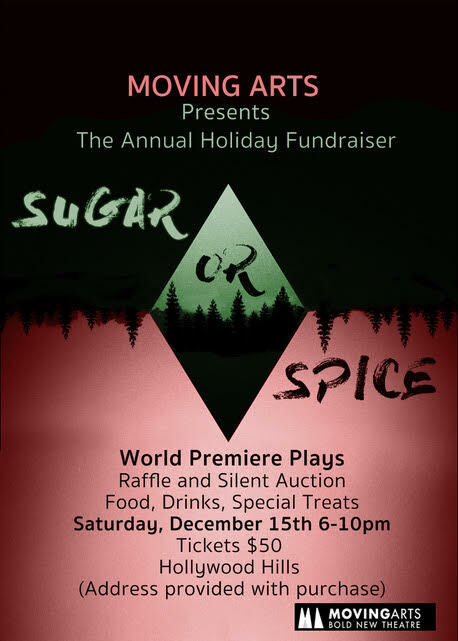 There will be food, drink, auction items, and site-specific plays. Moving Arts will be showing its unique form of storytelling by presenting five plays in different areas around a very nicely appointed house, nestled in the Hollywood Hills. It all starts at 6:00 p.m. on Sat, Dec 15. Tickets are $50 and can be purchased here. Hope to see you there!